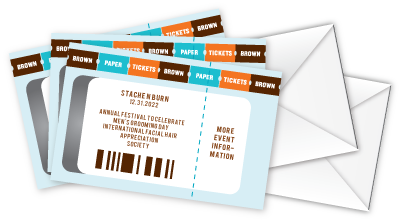 Create your event with us and put the power of the Brown Paper Tickets juggernaut behind it. It's 100% free for you and cheap for your ticket buyers! We never charge you for selling tickets through Brown Paper Tickets. No set-up fees, no sales fees, and no long-term contracts. And ticket buyers pay just $0.99 + 5%, regardless of whether they order online, by phone, or through our walk-up locations. Will-call, print-at-home, mobile delivery, or physical tickets? That's included as well! All credit card processing fees included! Our pricing includes all credit card processing. Don't be fooled by other ticketing services that make you pay an additional credit card processing fee. In-house 24/7 Call Center for event producers. Have questions about our system? Having an event emergency? Call us any time to get the support you need! In-house 24/7 Call Center for ticket buyers. Our call center staff can help with more than just sales. Is your ticket buyer having trouble finding your venue? We'll make sure they get there. In-house English, French, and Spanish sales and support. We know events and we speak your language. Our call center isn't one surly guy answering a phone. We handle thousands of calls per day and boast an average hold time of less than 30 seconds. Our in-house fulfillment service will print and ship tickets to your ticket buyers within 24 hours of their purchase. No cost to you to enable physical tickets for your events and no additional cost to ticket buyers to receive physical tickets. Express shipping of tickets also available to ticket buyers, with no mark-up to the actual shipping cost. Need a stack of pre-printed tickets to sell at the door? They're just $0.10 each, and are guaranteed to ship within 24 hours on orders of up to 10,000 tickets. Allow ticket buyers to receive their tickets on their mobile phone. Our patent pending Transfer-to-a-Friend™ tool allows ticket buyers to easily send tickets to their friends. Our location-aware mobile web app helps ticket buyers find your event. You can collect donations in addition to or independently from ticket sales. Use our free iPhone and Android ticket scanning apps to validate tickets at the door. Add images and videos to your event with ease. Use our Ticket Widget to let your ticket buyers begin the purchase process directly from your website. Enable Fast Checkout to let ticket buyers purchase your tickets in two easy steps. No fees for creating custom seating charts for assigned seating events. Let your ticket buyers choose their own seats or use our advanced algorithm to find the best available seats. See which seats are sold and which are available in real-time. With tens of thousands of ticket buyers on our daily event mailing list, your event will reach an entirely new audience. Enable automatic Last Minute Discounts for your event to fill your last few seats. Advanced MailChimp integration lets you easily create and send promotional emails, track the results, and add new ticket buyers to your lists. Our dedicated event promotions staff can provide advice and support for promoting your events. With options for your ticket buyers to easily brag about their purchases on social networks, your fans help drive your ticket sales. Our discussion system lets ticket buyers chat about your events and can push those conversations to Facebook, Twitter, and more. Sell tickets at the door using our box office tools. You can hire Brown Paper Tickets reps to manage and train your employees to run day-of ticket sales and check in patrons who are retrieving tickets from Will Call. For an additional fee, the reps can bring necessary equipment for day-of sales and Will Call check-in, such as laptops, WiFi hotspots, tablets (for scanning purposes), ticket printers, and credit card swiping equipment. Contact us at onsite@brownpapertickets.com for more information and a pricing guide. Create, edit, and manage your event at will. You can be as hands-on or hands-off as you want. With real-time sales stats for your events, you always know the status of your ticket inventory. Add additional questions to the purchase process to collect the specific information you need for your event. You get your ticket buyers' full contact information, including names, email addresses, and phone numbers. We've been helping venues and event producers sell tickets for more than a decade. During that time we've built out nearly every service and tool that we've been asked for. Are you looking for a specific tool that you don't see mentioned here? The odds are that we already have it. Contact us 24/7 at 1-800-838-3006 to find out what we can do for you.